Yesterday evening, we went to visit 55 year old widow, Kifaya Rishek, after her home in Beit Hanina, occupied East Jerusalem, was demolished on the 27th of January. After losing her house in Beit Hanina, where she lived together with her five children and 16 grandchildren, Kifaya has now moved with her family into a smaller 5th floor apartment in the Shuafat Refugee Camp, East Jerusalem. 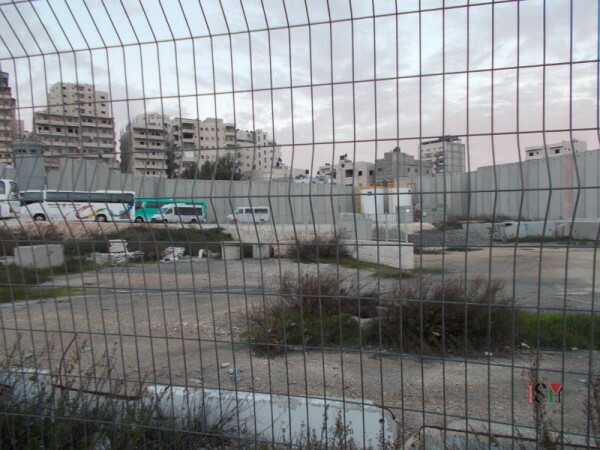 The Shuafat refugee Camp is completely surrounded by an Apartheid Wall and its residents must cross the Shuafat checkpoint in order to access the city of Jerusalem. 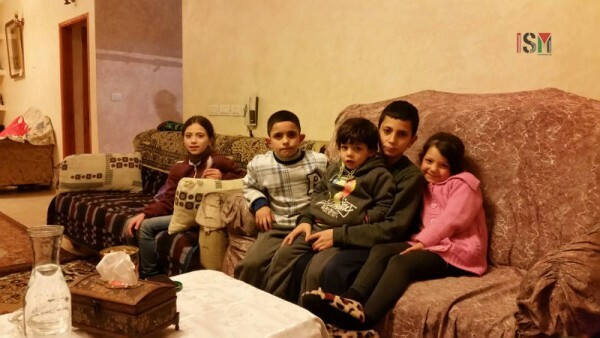 Her son, Ashraf, who used to live with her in Beit Hanina, now rents another apartment for 1.500 shekels a month in the same Camp, where he lives with his 4 children and wife. His brother, Murad, also had to find a new place to live and moved with his wife and four children into the Old City. Kifaya’s son Sherif pays the rent for the new home where the rest of them live together, costing him 1.700 shekels a month. Kifaya feels very sad as this place is not really her own. In their old house, the children had a patio where they could play outside. Kifaya recalls how much she misses her garden, with all the trees and plants she took care of for years, and today are all destroyed along the house. The children remember that the night before the house demolition they had asked Kifaya to clean their patio because they were expecting snow to fall and they wanted to play with clean snow in the morning. 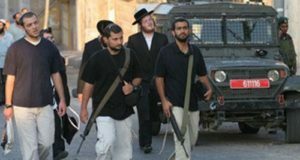 Since people never know when a house demolition will actually happen, that morning they woke up instead with the Israeli police breaking into their home with dogs, kicking everyone out. To this day, the children say they are scared that the police might come again and raid and destroy their home. From left to right: 10 year old, Tala; 8 year old, Bader; 3 year old, Fajer; 12 year old, Adel; and 5 year old, Mira. Apart from the new expenses of paying house rent, the family must cover other costs such as taxi transportation for their children to go to school. Just for 10 year old, Tala, alone they must pay a taxi driver 600 shekels a month to take her to school. The Camp has no proper public transportation, leaving many families with no choice but paying taxis. 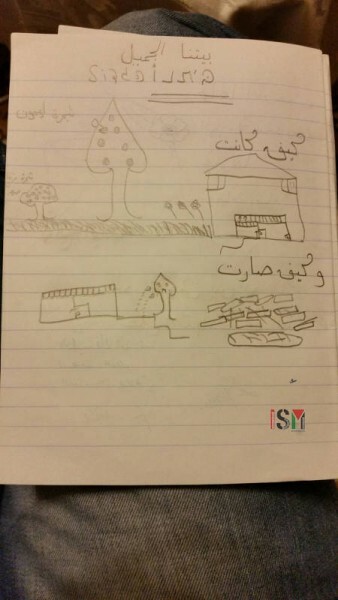 10 year old, Tala, made this drawing, showing her home before the demolition and afterwords in rubble. 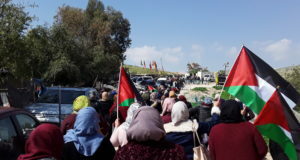 Another difficulty for Kifaya is that she must pay 120 shekels every time she takes her 11 year old granddaughter, Malak, to physiotherapy at the ALYN Hospital. Malak suffers from a physical disability in her legs. Although she receives special disabilities insurance, certain things in her treatment are not covered, such as the machines and her special boots, costing Kifaya another 1.000 shekels every time these need to be renewed as she keeps growing. 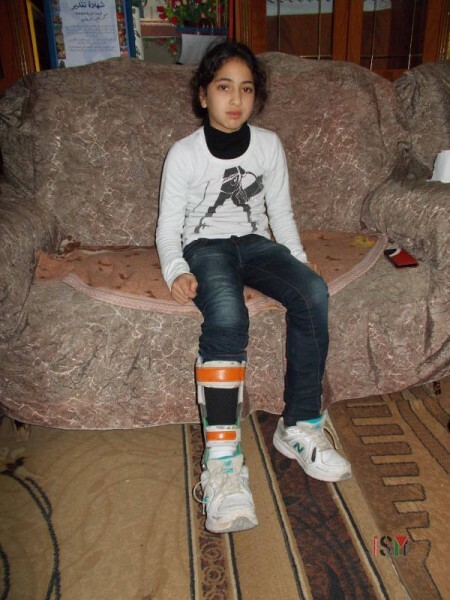 11 year old, Malak, has a physical disability in her legs and must take treatment in the ALYN Hospital. Her new home is tighter and general life in the Shuafat Camp is very difficult. 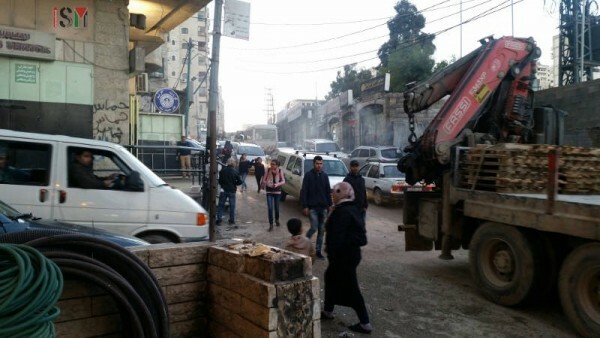 The Israeli Municipality, which is responsible for its services, does not provide sufficient water and electricity, and does not pick the garbage from the streets. 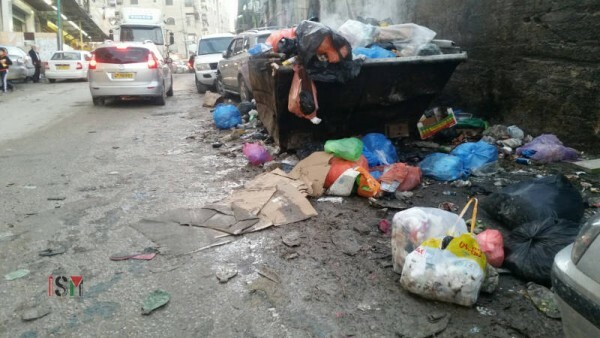 The Israeli Municipality is responsible for services such as picking the garbage, but they refuse to do so and the streets are always dirty. Just as in Kifaya’s case, Jerusalemite Palestinians who come to live here do so in order not to lose their Jerusalem ID’s, which basically allows them to continue living in Jerusalem. Israel’s policy of house demolitions, together with the ever growing living costs in Jerusalem, are all part of a broader plan to force Palestinians to leave the city or, as a last resource, move into the over crowded Shuafat Refugee Camp. 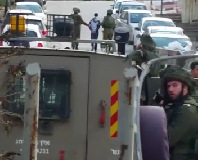 The streets in the Camp are in very bad conditions with holes and traffic jams are seen everyday.